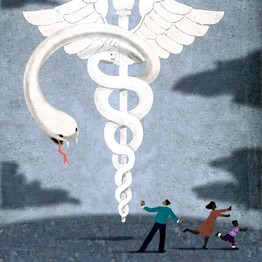 “The Coming ObamaCare Shock” Reblog from the Wall Street Journal. Millions of Americans will pay more for health insurance, lose their coverage, or have their hours of work cut back. By DANIEL P. KESSLER, April 29, 2013. These individuals are worried for good reason. The unpopular health-care law’s rollout is going to be rough. It will also administer several price (and other) shocks to tens of millions of Americans. Start with people who have individual and small-group health insurance. These policies are most affected by ObamaCare’s community-rating regulations, which require insurers to accept everyone but limit or ban them from varying premiums based on age or health. The law also mandates “essential” benefits that are far more generous than those currently offered. According to consultants from Oliver Wyman (who wrote on the issue in the January issue of Contingencies, the magazine of the American Academy of Actuaries), around six million of the 19 million people with individual health policies are going to have to pay more—and this even after accounting for the government subsidies offered under the law. For example, single adults age 21-29 earning 300% to 400% of the federal poverty level will be hit with an increase of 46% even after premium assistance from tax credits. Determining the number of individuals who will be harmed by changes to the small-group insurance market is harder. According to the Medical Expenditure Panel Survey, conducted by the Department of Health and Human Services, around 30 million Americans work in firms with fewer than 50 employees, and so are potentially affected by the small-group “reforms” imposed by ObamaCare. Around nine million of these people, plus six million family members, are covered by employers who do not self-insure. The premium increases for this group will be less on average than those for people in the individual market but will still be substantial. According to analyses conducted by the insurer WellPoint for 11 states, small-group premiums are expected to increase by 13%-23% on average. This average masks big differences. While some firms (primarily those that employ older or sicker workers) will see premium decreases due to community rating, firms with younger, healthier workers will see very large increases: 89% in Missouri, 91% in Indiana and 101% in Nevada. Because the government subsidies to purchasers of health insurance in the small-group market are significantly smaller than those in the individual market, I estimate that another 10 million people, the approximately two-thirds of the market that is low- or average-risk, will see higher insurance bills for 2014. Higher premiums are just the beginning, because virtually all existing policies in the individual market and the vast majority in the small-group market do not cover all of the “essential” benefits mandated by the law. Policies without premium increases will have to change, probably by shifting to more restrictive networks of doctors and hospitals. Even if only one third of these policies are affected, this amounts to more than five million people. In addition, according to Congressional Budget Office projections in July and September 2012, three million people will lose their insurance altogether in 2014 due to the law, and six million will have to pay the individual-mandate tax penalty in 2016 because they don’t want or won’t be able to afford coverage, even with the subsidies. None of this counts the people whose employment opportunities will suffer because of disincentives under ObamaCare. Some, whose employers have to pay a tax penalty because their policies do not carry sufficiently generous insurance, will see their wages fall. Others will lose their jobs or see their hours reduced. Anecdotal evidence already suggests that these disincentives will really matter in the job market, as full-time jobs are converted to part time. Why would employers do this? Because they aren’t subject to a tax penalty for employees who work less than 30 hours per week. There is some debate over how large these effects will be, and how long they will take to manifest. However, the Bureau of Labor Statistics reports on a category of workers who will almost surely be involuntarily underemployed as a result of health reform: the 10 million part-timers who now work 30-34 hours per week. These workers are particularly vulnerable. Reducing their hours to 29 avoids the employer tax penalty, with relatively little disruption to the workplace. Fewer than one million of them, according to calculations based on the Medical Expenditure Panel Survey, get covered by ObamaCare-compliant insurance from their employer. In total, it appears that there will be 30 million to 40 million people damaged in some fashion by the Affordable Care Act—more than one in 10 Americans. When that reality becomes clearer, the law is going to start losing its friends in the media, who are inclined to support the president and his initiatives. We’ll hear about innocent victims who saw their premiums skyrocket, who were barred from seeing their usual doctor, who had their hours cut or lost their insurance entirely—all thanks to the faceless bureaucracy administering a federal law. The allure of the David-versus-Goliath narrative is likely to prove irresistible to the media, raising the pressure on Washington to repeal or dramatically modify the law. With the implementation of ObamaCare beginning to take full force at the end of the year, there will be plenty of time before the 2014 midterm elections for Congress to consider its options. For those like Health and Human Services Secretary Kathleen Sebelius, who told a gathering a few weeks ago at the Harvard School of Public Health that she has been “surprised” by the political wrangling caused so far by ObamaCare, there are likely to be plenty of surprises ahead. 1 Response to “The Coming ObamaCare Shock” Reblog from the Wall Street Journal.